With over 50 years combined industry experience, the two founding Directors John Bowman and Keith Little bring a vast wealth of knowledge, experience and innovation to this dynamic new company. Provision and management of inspection services on and offshore including lifting equipment, non-destructive testing and rope access activities. Great effort by all to get this certification in place so soon, thanks to the Team at Sitecut for the systems and the Team at BSI for their guidance and advice. ASG Inspection Ltd. is formally recognised as a Member on DROPS, the industry-wide initiative focused on preventing dropped objects in the workplace. Category I: Authorised to do measurements on all types and sizes of ships. DNV GL - 402B Service approval - Non-Destructive Testing (NDT) on classification projects , in accordance with Class Programme DNVGL-CP-0484. ASG Inspection have been appointed as a Probationary Operator by IRATA. Great effort by all involved once again to get this membership in place, thanks to IRATA once again for their support and guidance. ASG Inspection gains Corporate Membership of BINDT and will affilate to the North East Scotland Branch. ASG Inspection is recoginised as a Corporate Partner of ASNT and will affilate to the North Atlantic Section. Proud to announce that after our recent audit by IRATA we are now a Full Member - (Operator) of IRATA International. Thanks to IRATA and our auditor for once again a full and comprehensive audit and to our ASG team for their continued focus on doing things right the first time. 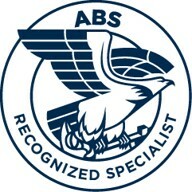 After another successful audit, ASG Inspection have been awarded ABS External Specialist Approval. Thanks to all involved in the audit process. After our recent audit by LEEA – (Lifting Equipment Engineers Association), ASG Inspection Ltd. have been invited to join as a Full Member. 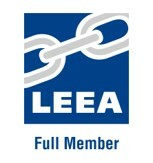 LEEA is seen as an industry ‘Best Practice’ and we are proud to announce we are now a Full Member of their Association. Our membership of the association compliments our suite of memberships and accreditations demonstrating our commitment to our Industry. Thanks once again to our LEEA Auditor and to our ASG Staff for their continued support and commitment as the company continues to grow. ASG Inspection Ltd. are proud to announce this landmark accreditation gaining DNV GL Approved Service Supplier for Phased Array Ultrasonic’s (PAUT). This approval increases our Approved Service Supplier offering to now include PAUT Inspection of Pins, Shafts, Bolts and Mooring Chain. • DNV-GL Class approval for Phased Array (PAUT) testing of Anchor Chain. With a significant investment, working with like-minded colleagues, embracing advancements in technology and by listening to Clients on their need for non-intrusive inspections, reduce downtime, reduce safety risk exposure, avoiding unnecessary strip down and re-build but still meeting Client and Class Inspection requirements. STOP pulling Bolts, Pins and Shafts for Inspection until you have spoken to us – even if it is just the one item that’s difficult to pull, contact us and we can advise if it can be inspected in-situ with PAUT.